What lessons can we learn from the failure of this rotten tree? Are we like this tree? How did it impact those around it when it fell? How can we guard against this? (Matt 7:24-27) Therefore whosoever hears these sayings of mine, and does them, I will liken him unto a wise man, who built his house upon a rock: And the rain descended, and the floods came, and the winds blew, and beat upon that house; and it fell not: for it was founded upon a rock. And every one that hears these sayings of mine, and does them not, shall be likened unto a foolish man, who built his house upon the sand: And the rain descended, and the floods came, and the winds blew, and beat upon that house; and it fell: and great was the fall of it. (Matt 23:3) All therefore whatsoever they bid you observe, that observe and do; but do not according to their works: for they say, and do not. (Matt 23:27-28) Woe to you, scribes and Pharisees, hypocrites! For you are like whitewashed sepulchers, which indeed appear beautiful outwardly, but are within full of dead bones, and of all uncleanness. Even so you also outwardly appear righteous unto men, but within you are full of hypocrisy and iniquity. 1. A person who pretends to be what he is not. 2: A person who professes beliefs and opinions that he or she does not hold in order to conceal his or her real feelings or motives. How to not be ignorantly hypocritical: Examine ourselves, more than skin deep. (Jas 1:21-5) Therefore put away all filthiness and extreme wickedness, and receive with meekness the engrafted word, which is able to save your souls. But be you doers of the word, and not hearers only, deceiving your own selves. For if any be a hearer of the word, and not a doer, he is like unto a man beholding his natural face in a mirror: For he beholds himself, and goes his way, and immediately forgets what manner of man he was. But whoever looks into the perfect law of liberty, and continues in it, he being not a forgetful hearer, but a doer of the work, this man shall be blessed in his deed. Even if we don’t get at our core, YHVH (the Lord) will. (Jer 17:9-10) The heart is deceitful above all things, and desperately wicked: who can know it? I YHVH search the heart, I test the mind, even to give every man according to his ways, and according to the fruit of his doings. 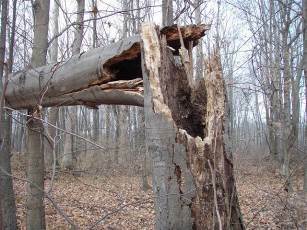 Don’t be like the rotten tree, as with exercise, doing strengthens our core. Be a doer and not a hypocritical hearer only.